I make these sourdough babies weekly, and over months have tweaked my recipe to the point where they turn out just how I like them every time. These ones were especially good, so couldn't resist taking a pic and posting. Anyone interested in my recipe, you can find it here. Aveagoodweegend all, and best o bakin' to you! You got a nice golden brown bake here....and they puffed up really well! They're obviously the result of careful testing, fine-tuning and intense flavour optimization studies, Ross! Great work! Would you care to comment on your choice of flour? People always bark at me when I mention the words "AP flour" and "bagels" in the same sentence. I'm happy to see that your recipe calls for an AP equivalent. I would be interested in learning from a bagel connoiseur as yourself: What made you swing towards that particular flour? Receiving such positive comments from a baker I hold in the highest esteem is truly gratifying. I use organic 'plain flour' in my bagels, and I think this is the closest Australian flour type to the American 'AP' flour, although it may not be exactly the same. In my breads I use only local premium quality biodynamic organic stoneground flours, and would also do so in my bagels if my chosen flour producer offered a 'plain flour' product, but they don't. So, I settle for next best, which is unbleached and 'organic', but just off the supermarket sheves. Why plain flour and not a higher gluten, higher protein baker flour? Only because bagel dough is quite low hydration in comparison to the breads that I make and yields a relatively tight crumb that is on the chewy side, and given this, I think the spongy, softer texture plain flour imparts is preferable to the stronger structure characteristic of baker flour. Which is a complicated way of saying I think bagels are naturally chewy enough without adding to the chew factor by using baker flour. Also, I figure that the crisp thin crust you get in bagels goes better with a slightly softer crumb. It's probably all down to personal taste, though. Seems your taste and mine coincide in this context! Cheers and the best of weekends to you, too! beautiful color on those bagels!! 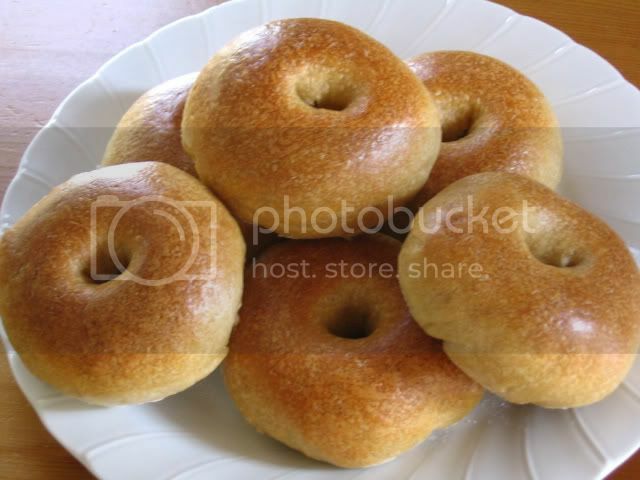 Wow those are Gorgeous Bagels! 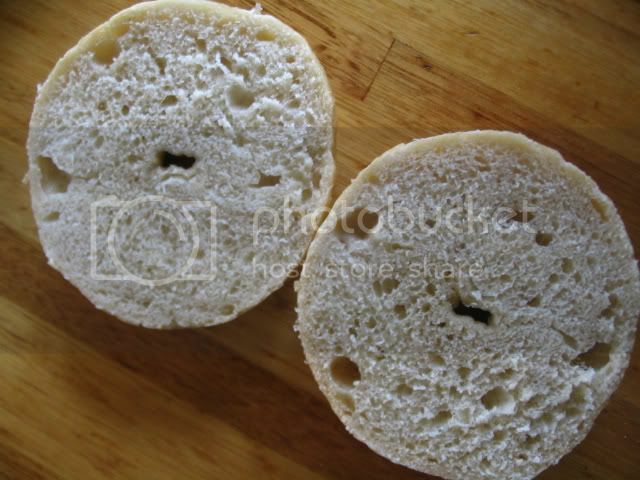 Oh they sound perfect, bite, crumb, crust...just delicious and the way I like my bagels...when I indulge! THANKS for your comments - appreciated.